Yesterday we checked in on the status of the NL all-star races; today, it’s the American League’s turn. Who’s in, and who’s out–and more importantly, who should represent the AL in the Midsummer Classic? Perez has put together another impressive campaign in KC. Sally currently leads all American League catchers in runs (20) and RBI (31). That is pretty impressive by itself, but when you consider how utterly woeful the Royals’ offense has been this season (As of Tuesday, they had yet to score 200 runs, dead last in the major leagues), Perez’s performance is even more impressive. His average (.254) is a bit lower than manager Ned Yost might want, but Perez provides a power bat (11 bombs on the season, leading AL catchers) and stellar defense behind the dish. He’s an obvious choice to start for the American League. The real race here is for second prize. Balitmore’s Welington Castilo currently holds a 30,000 vote lead over Brian McCann of Houston. Both would be good second choices to back up Perez. Castilo has put up good offensive numbers this season with a .317/.432/.625 slash line, but his defense is average at best (1.0 fielding runs above average this season, per Fangraphs). McCann has also impressed this season, but I still remain skeptical how much his success in counting statistics is a product of a terrific Astros lineup around him. Either one has a good case to make the team, but I’d give the slight edge to Castilo for second. Compared to an absolutely loaded race at this position in the National League, the AL is a bit lackluster. Cabrera is at the top of the heap more due to past successes that his current performance. He still has only 5 home runs and a .274 average, though he has started to heat up at the plate over the past two weeks. By the time the players take the field in Miami, Cabrera’s stats should be more in line with his career numbers. Yonder Alonso?! Yup. Yonder Alonso. This race has been tilted by veterans with surprisingly successful seasons. 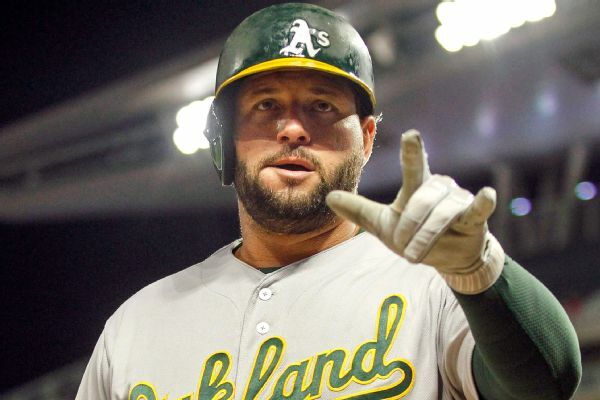 No one thought we’d be talking about Yonder Alonso of Oakland in an article about AL all-stars in June, but here we are. It’s hard to keep him out of the conversation–he leads AL first basemen in homers with 16, has a batting average above .300, and has been one of the few positive things to talk about in Oakland this season. Justin Smoak started the season poorly (like most of the Blue Jays lineup), but he’s used a torrid May to propel himself to a .287 average with 15 homers; he also leads AL first basemen in RBI. Smoak isn’t likely to make the all-star game though; I’d expect Cabrera, Alonso, and maybe Eric Hosmer (.308/.361/.444) to man first for the AL. Altuve has more votes than any AL player not named Mike Trout or Aaron Judge. He deserves every single one of them; he is the best second baseman in the American League, and arguably all of baseball. He leads all AL second basemen with a .326 average, 39 runs, and 11 steals. Altuve also sports a .520 slugging percentage, showing that last year’s power spike (24 home runs) was no fluke. 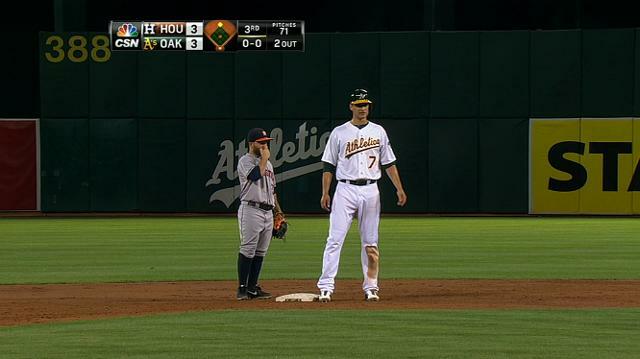 Plus, Altuve in the starting lineup will hopefully give us the chance to see his 5’6″ frame next to He-Man Aaron Judge, who comes in at 6’7″. That little guy? Yeah, he’s pretty good. I’m glad to see Starlin Castro safely in second in the voting for this race. Castro was written off by some after the Cubs offloaded him to the Bronx, but he’s put together a career year and has been a major part of the resurgence of the Bronx Bombers. Castro has excelled at the plate with a .326/.393/.520 slash line and 31 RBI. His defense continues to be suspect, but amidst mediocre seasons from other second base stalwarts like Dustin Pedroia and Brian Dozier, Castro is a good choice to represent the AL alongside Altuve. With apologies to my blogging colleague and die-hard Indians fan Brett Hall, Robbie Cano should be ahead of Jason Kipnis on this list. Cano has been producing mostly in line with his career numbers, posting a .282 average and 34 RBIs (he leads AL 2B in that category). Kipnis struggled with injury early in the season, and while his power is back (7 homers in 39 games), his average is still barely above .230. Altuve and Castro are the top two guys for the AL, but Cano might merit an all-star nod himself. After Sano, it gets interesting. You might expect Manny Machado or Josh Donaldson to come next in the running, but that spot is currently held by Jose Ramirez of Cleveland. Ramirez is a more understated player than Machado or Donaldson; he doesn’t flash the leather like Manny or “bring the rain” like Donaldson, but he’s excellent at the plate and the hot corner. He combines a strong average (.291) and the speed for potential steals (6) and extra-base hits (21) with decent power numbers (7 homers) and solid defense. Machado and Donaldson may be more popular players, but the fans have this one right: Ramirez deserves an all-star nod for Cleveland. Oh boy. Here we go. Brett and I have a long-standing debate over who’s the better shortstop: Lindor or Carlos Correa of the Houston Astros. And both are excellent, and both deserve to be in Miami this summer. But Correa should get the start by a nose over Lindor. The best two shortstops in baseball: Correa and Lindor. There’s very little to divide the two players. Lindor’s power surge this season means he holds a 12-11 lead in home runs. Correa, in contrast, has a 38-37 lead in runs. Correa strikes out more, but also draws more walks than Lindor. Neither has had a standout season defensively, though Lindor gets a very slight edge (-1 defensive runs above average, compared to Correa’s -2). Correa inexplicably has yet to attempt a steal this season, where Lindor has 3. The difference lies in average and OBP; Correa’s .310/.388 mark is well ahead of Lindor’s .268/.333 stat line. It seems that in an effort to increase his power numbers, Lindor has sacrificed some of his hit-to-contact mindset. Correa, however, has a more natural power in his swing, allowing him to post strong numbers across the board. Both Correa and Lindor are fantastic options, and we as baseball fans are lucky to be able to watch these guys compete for years to come. Either one would be an excellent and worthy starter for the AL in Miami; but if you ask this humble baseball writer, Correa has the narrowest of edges over Lindor. One batter leads all designated hitters in runs, hits, average, on-base percentage, and slugging percentage. And it’s not Nelson Cruz; it’s Corey Dickerson, the Rays’ DH. He should start the all-star game for the American League, not Cruz. Yes, I know, Cruz mashes the ball (14 HR on the season), and leads the entire American League in RBI. And he would be a respectable choice. But Dickerson has had the better season, trailing Cruz by only one homer, and leading him in most other offensive categories. He should make his first all-star appearance this summer. I’m a bit surprised not to see Albert Pujols in the top five for this category, especially coming off of his 600th home run. Admittedly his average (.248) leaves a bit to be desired, but 9 bombs and 42 RBI isn’t anything to scoff at, and I would expect him to get a voting bump with his big milestone. Even injured, Mike Trout will probably (and deservedly) receive all-star accolades again this season. But given that he won’t start, let’s exclude him from this conversation for the moment and look at the three potential starters given the votes from this week. I was a doubter at the beginning of the season. I doubt no longer. Aaron Judge is here to stay, and will not only win AL Rookie of the Year; he may well walk away with the MVP. The next two spots in all-star voting are held by Michael Brantley and Mookie Betts. Brantley has picked up where he left off before his shoulder injury with Cleveland, posting strong numbers in most every offensive category. His seven steals have been impressive, and his .309 batting average is just above his career standard. His power is a big lacking (just five home runs), but Brantley is a feel-good choice for one of the starting outfield spots this summer. Michael Brantley: AL Comeback Player of the Year. Betts isn’t the worst choice for the last spot (.264/.343/.468, plus some stellar defense), but the one who really deserves it is Houston outfielder and leadoff man George Springer. His .347 OBP may be just a touch underwhelming for a leadoff bat, but his 16 home runs outpaces every other leadoff man in the bigs, and his 43 runs are second only to Judge in the American League. No one has done a better job setting the table than Springer this year; he has been the starting point of what has turned into a dominant Astros team. He deserves his first all-star nomination. Disagree with me? Of course you do — that’s baseball. But don’t blame me; go help your favorite players make it to Miami. You can fill out your all-star ballots here.